Several weeks ago, I received a text from a patient. Her question to me was “Can the diaphragm have a trigger point you can treat?” Now to be honest, I have been asked a lot of questions over the years I practice Medical Massage, but this one was a little out there. I texted her back to ask what was going on. She replied that she was having a very low level of blood oxygenation. She went on to tell me that she was experiencing unbelievable exhaustion and she had seen her doctor. While checking in and taking her vitals, the medical assistant measured her blood oxygen content and immediately notified the physician because Pulse/Oxymeter (little device placed on patient’s finger in the medical office) showed only 82% oxygen saturation in her blood. A normal reading should have been 98-100%. Needless to say, the alarm bells went off in the doctor’s office. Her primary care physician, who regularly refers patients to our clinic, did some additional testing that all turned out negative. Next, he referred the patient to a pulmonologist, a cardiologist and a neurologist for further evaluation and resolution. None of referrals could resolve her issue. Finally, the patient was referred to a medical doctor who was also an acupuncturist. The patient received multiple acupuncture treatments, but as with everything else, there were no changes in the blood oxygenation level. The patient continued to feel complete exhaustion which greatly affected the quality of her life. She was mostly staying at home in bed since even regular walks became an unbearable task. Now a bit of history, I have been seeing this patient for several years for what I would consider various “normal” somatic abnormalities which we were able to successfully fix or manage. She and her husband live about 100 miles west of San Antonio where I have my practice. Because of the distance they have to travel to see me I have trained them to do a lot of self-therapy similar to what I do in my practice. They also have purchased an electric massager just like the one I use and they know how to correctly apply Vibration Therapy. Since I don’t normally work on patients with pulmonary disorders, I needed to get more information. I opened Medical Massage Volume I, Second Edition textbook on page 8. Looking at the Figure 5, I was able to see that the lungs were innervated by T-1 thru T-4. Looking at page 9, Table 1, I was able to determine the effect the sympathetic and the parasympathetic divisions of the autonomic nervous system had on the lungs. Armed with this knowledge, I texted the patient and told her to have her husband do the Dermographism Test. (Yes, I had trained them how to do that test about a year or two prior to this issue.) In less than a minute, she texted me that the result was a very bright Red Dermographism skin’s reaction. At this point it was obvious that her parasympathetic tone was dramatically higher and this was the reason for mild reflex bronchoconstriction which decreases the level of oxygen in her blood. Such reflex reaction was prominent only when she was physically active and examination of her lungs during the rest didn’t show any abnormalities. As a test I asked her husband to apply permanent electric vibration to the spinous processes of T-1 thru T4 and to monitor her blood oxygen level with a Pulse/Oxymeter sensor placed on her finger. He replied that within seconds of applying vibration her oxygen level started to climb from 82% to the almost normal number of 97%. I told him to apply vibration as needed until I could actually treat her in my office. She came in a couple of days later. I started with the examination of reflex zones which may have formed in the soft tissues secondary while contributing to disbalance between parasympathetic and sympathetic divisions of the autonomic nervous system. My theory was that by restoring the balance within the autonomic nervous system I would be able to reduce or eliminate bronchoconstriction, restore pulmonary function and a normal level of oxygen in the blood. For the evaluation of reflex zones I used Glezer/Dalicho charts for pulmonary disorders from Medical Massage, Volume II, page 157. Fig. 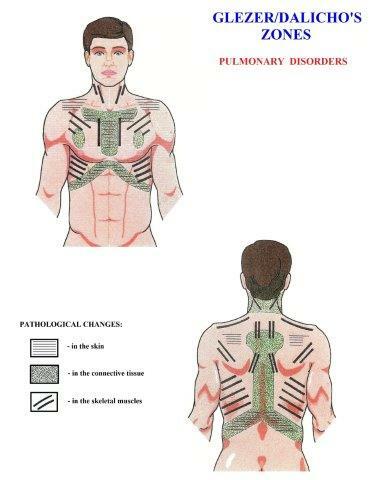 1 illustrates Glezer/Dalicho zones for the pulmonary disorders. Fig. 1. Glezer/Dalicho Zones for pulmonary disorders. Evaluation of my patient’s soft tissues according to the charts indicated that reflex zones were especially active on the anterior neck and chest. Armed with this data I designed a treatment strategy which started on the posterior neck and upper back as origins of innervations of the affected tissues and later switched to work on the soft tissues on the anterior neck and chest on a layer by layer basis (skin, fascia, muscles, periosteum). I combined and modified for her Anterior Scalene Muscle protocol and Pectoralis Major and Minor Muscles protocol from the Video Library of Science Of Massage Institute I am using daily in my practice. It has now been more than several weeks and her oxygen saturation levels have been stable in the 97-98% range, which is normal. All of her symptoms of severe exhaustion have disappeared, and she has a completely normal life. As Dr. Ross Turchaninov has always told us, ‘Medical Massage gives you all the answers when you read your patient’s body clues correctly.’ And that it has! 1. The chronic abnormalities in the function of inner organs ALWAYS trigger secondary formation of reflex zones in the soft tissues, which share the same level of innervation from the spinal cord. Sometimes the reflex zones can be so active that only their elimination decisively restores function of the affected inner organ. This case study is an exceptional example of this clinical phenomenon. 2. Detection of reflex zones and their elimination is the main goal of Medical Massage therapy. No other branch of medicine has the necessary set of clinical tools and time to completely eliminate reflex zones, restore function and interaction of soft tissues on a layer by layer basis: skin, superficial and deep fascia, skeletal muscles and periosteum. This approach allowed Curt to help his patient with simple solutions for a serious problem when every other modality failed. 3. Curt applied the combination of techniques and approaches to restore balance within the autonomic nervous system. By doing that he affected and altered the function of the peripheral receptors in the soft tissues which share the same innervation with the lungs. As a result of resetting peripheral receptors the bronchoconstriction was eliminated and the oxygen blood level normalized. We think the therapist’s equal participation in the treatment of visceral disorders is the highest level of his or her professional expertise.